First off, you should know that I meant to post this like 6 full weeks ago or something--back when it was still berry picking season around here. But, of course, I procrastinated on making the jam since our kitchen is not air conditioned (welcome to living in a home from the 1920's) and it felt like you were living inside someone's mouth about 6 weeks ago while that terrible heat wave was breathing all hot and heavy on the U.S. So, I froze the berries and waited--then I went away for a weekend to a dear friend's house and she not only had central air, but also a beautiful kitchen--so she kindly let me go to work and do my canning while I was there. 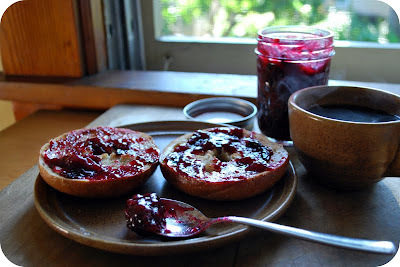 But since then, sheer laziness has taken hold as the summer wanes and the jam sits in quiet little rows in the basement. Mmmmm!!! It looks so tasty!! !